One does not bang on the drug target known as the G-protein-coupled receptor (GPCR) as though it were a drum. Neither does one play the GPCR like a violin. The GPCR is something in between, an instrument with just a few notes, but it can be surprisingly expressive, provided it is handled deftly. This point has been demonstrated by virtuoso scientists based at Duke University. Practicing on the angiotensin receptor, a GPCR responsive to the touch of hormones and blood pressure medications, the scientists showed that different medications “squeezed” the GPCR into different shapes, eliciting different effects. 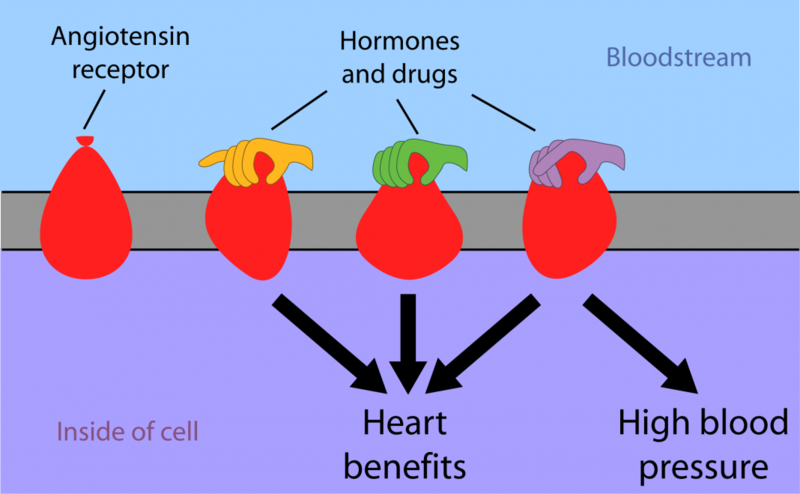 The scientists, led by cardiologist Robert J. Lefkowitz, MD, discovered that the angiotensin receptor assumes four main shapes: one associated with angiotensin receptor blockers (ARBs) that turn the receptor completely off, one associated with angiotensin II and drugs that turn the receptor fully on (both increasing blood pressure and improving heart function), and two associated with the drugs that improve heart function without increasing blood pressure. These findings suggest a structural mechanism for biased ligand action at the angiotensin receptor. Moreover, such mechanisms could be common among GCPRs. If so, such mechanisms could be exploited to rationally design GPCR-targeting drugs that produce more specific effects. For example, drugs could be designed to produce health-promoting molecular harmonies that would be free of sour notes, that is, side effects. Lefkowitz and colleagues debuted their work in the journal Cell, in an article titled, “Angiotensin Analogs with Divergent Bias Stabilize Distinct Receptor Conformations.” The article described how the Duke team, in collaboration with scientists at UCLA and Stanford, used a sophisticated technique called double electron-electron resonance spectroscopy to map the shape of the receptor when it interacts with different classes of hormones and drugs. Blood pressure drugs called ARBs treat high blood pressure by preventing angiotensin II from binding to its receptor. But in doing so, these drugs also block angiotensin II’s beneficial effects, including increases in the heart’s strength and performance. Ideally, physicians would like to block the angiotensin receptor’s effects on blood pressure without losing its positive effects on heart function, said Lefkowitz. The paper cited above indicates that just as squeezing only the top of a balloon alters its entire shape, the binding of hormones and drugs to the outside of a receptor causes changes in parts of the receptor which face into the cell. Different hormones and drugs push different “buttons” on a receptor, changing its shape in different ways. “It’s like seeing a silhouette of the receptor—an outline of its shape from one viewpoint,” Wingler noted. In a second paper, the Duke group worked with the laboratory of Andrew C. Kruse, PhD, a professor at Harvard Medical School, to use x-ray crystallography to see the fine details of the receptor when it is frozen in the “fully on” state. Wingler compares this approach to seeing an intricate, three-dimensional statue of the receptor. Importantly, it let them see how one drug interacts with the receptor and what “buttons” it presses to change the shape of the receptor. GPCRs sit in the membrane that surrounds cells and interact with hormones and drugs in the bloodstream. The GPCR family includes receptors for adrenaline, histamine, opioids, and the many molecules responsible for taste and smell, and they are the target of about one-third of all FDA-approved drugs. NewGene to Provide NimbleGen Sequence Capture Services in the U.K.